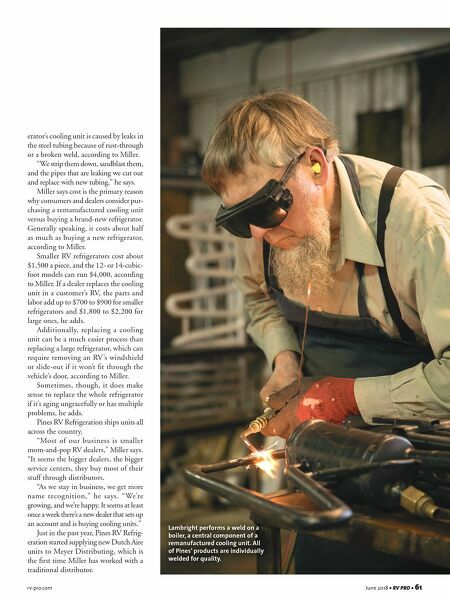 60 • RV PRO • June 2018 rv-pro.com F ifteen years ago, Larry Miller made a "cool" career change. That's when Miller decided to con- vert the barns and sheds on his farm in northern Indiana from raising livestock to producing remanufactured cooling units for RV refrigerators. "I bought this business in March 2003, and we've slowly built it up," says Miller, owner of Pines RV Refrigeration in Shipshewana, Ind. "Some years it was faster than others, but every year, we've had growth." In addition to rebuilding cooling units for RV refrigerators, Pines RV also completes the assembly of new refrigeration units built by JC Refrig- eration, a company owned by Miller's brother-in-law, JR Lambright. Those new units are sold at the wholesale level under the Dutch Aire label. "My brother-in-law is a half-mile from our location. He builds the new cooling units for me," Miller says. "He bends them, welds them together, charges them, test-runs them and paints them. I've got the foam package and insulation package, and we put that on here." Responding to a Need There is no good data regarding the failure rate for RV refrigerator cooling systems. Still, it happens frequently enough to make it worthwhile for Miller and a few other small players to sell remanufactured units to dealers. As for why RV refrigerator cooling systems fail, the causes are varied. 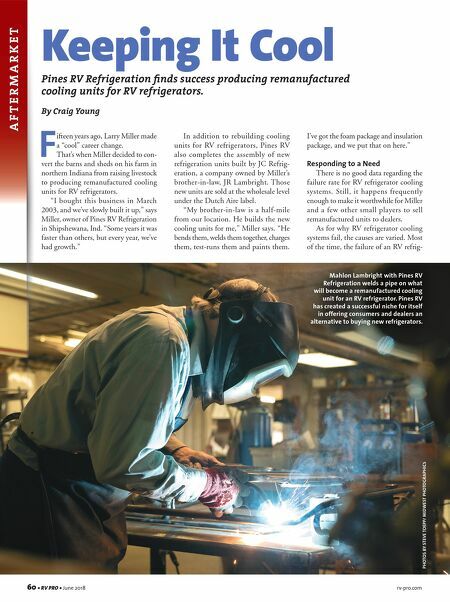 Most of the time, the failure of an RV refrig- Keeping It Cool Pines RV Refrigeration finds success producing remanufactured cooling units for RV refrigerators. By Craig Young A F T E R M A R K E T PHOTOS BY STEVE TOEPP/ MIDWEST PHOTOGRAPHICS Mahlon Lambright with Pines RV Refrigeration welds a pipe on what will become a remanufactured cooling unit for an RV refrigerator. Pines RV has created a successful niche for itself in offering consumers and dealers an alternative to buying new refrigerators.